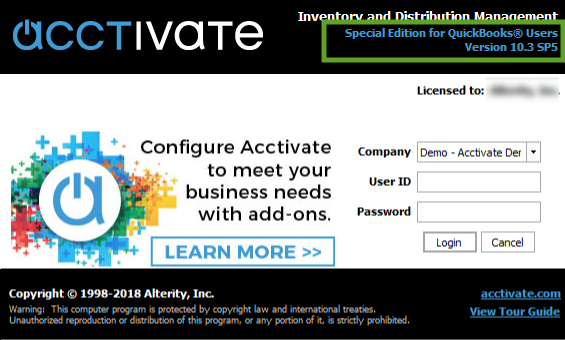 You can read more about Acctivate Version 10.3 or proceed to download the software updates below. The following Acctivate software updates are available for companies with an active Software Maintenance and Support (SMS) plan or Software-as-a-Service (SaaS) subscription. Your software license will be verified during the server update. You will be prompted for your Acctivate ID and Password. This information was provided via email when you first registered Acctivate. Download and install these updates on your server. Each workstation will be updated automatically. Be sure to select the appropriate Update for your Acctivate edition below. When you start Acctivate, you will find the version of Acctivate currently installed on the splash screen. After installing the appropriate Update, open each company on the server to upgrade the database(s) before attempting to run Acctivate on any other workstations. Use the Update link if you are running Version 10.3 or later, the Cumulative link if you have an older version or the New Install on a computer without Acctivate. Read the release notes for this update. Use the Workstation Install link only for new workstations. Do not use this link if an older version of Acctivate is already installed. You must install Acctivate on the server before any workstations can be installed. Existing workstations will be updated automatically. All users running Acctivate Mobile must download and install this update after upgrading the Acctivate Server. Use the Update link if you are already running Acctivate Mobile. The New Install link should only be used for a computer that does not have an older version of Acctivate Mobile installed. Review the Mobile Installation Guide if you are just setting up Acctivate Mobile for the first time.